More Trouble Ahead For The NASDAQ Composite Index? 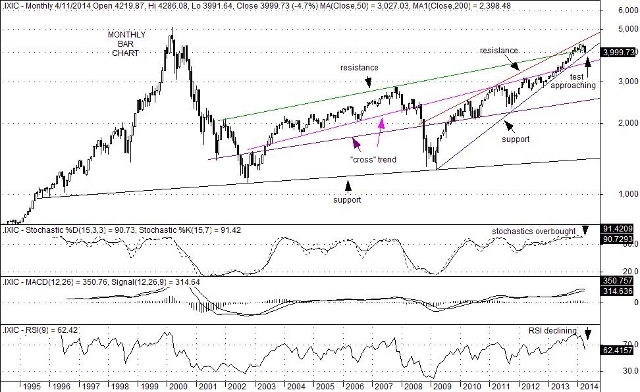 Although the NASDAQ Composite Index (IXIC) has already dropped by 8.50% from its 4,371 high set on March 7th, a break below key upward sloping trend line support now at 3,920 would likely trigger another round of technical selling. In addition, overbought conditions on longer term (monthly) charts underscore the bearish intermediate-term case for the IXIC. If a break below support at 3,920 did unfold, the NASDAQ composite Index could potentially test key “cross” trend support currently sitting at 3,580. Such a move would represent another 10% decline on the IXIC from current levels and an overall tumble of more the 18% from its March 7th high. (Note: this same “cross” trend held as support between 2003 and 2008 before breaking solidly below it in 2008). This outlook, of course, is purely technical in its assessment of price activity on the IXIC. Nevertheless, the recent rotation out of momentum stocks and into lower beta sectors of the equity market does not yet appear to be over. Fundamentally, worries over deflation or at least the absence of inflationary pressures in Europe remain an issue. Political uncertainty regarding Ukraine continues to be troubling as well. Still, a possible 18% correction might actually be welcomed by investors who have maintained a higher than normal amount of cash. Moreover, such a pullback in equity prices could sent interest rates lower which, in turn, might spur a lift in mortgage activity, home buying and new construction starts. In the end, such an outcome would likely boost economic activity in general and a healthy rise in GDP in the not-too-distant future. This entry was posted on Monday, April 21st, 2014 at 11:23 am	and is filed under NASDAQ Composite Index (IXIC). You can follow any responses to this entry through the RSS 2.0 feed. You can leave a response, or trackback from your own site.